So many customers, so little "open". 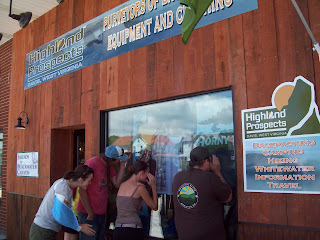 The Highland Prospects' shindig was indeed a "Grand" Opening. The post party at the Brew Pub was a rager as well. Overall, I'd say the whole affair was a big success. So successful in fact, that despite throngs of would-be shoppers the shop was dark and unopened until Sunday afternoon. What happened to those scallywags? Where would two (2) malevolent sailors be on the Lord's day? We may never know, but by the crack of noon one (1) of pirates surfaced from the ether to unlock the door. What I do know is that this weekend should be another bum-rush of events. A mountain bike festival is rolling into town, Uncle Mackie is celebrating a birthday with a Friday night party at Hellbender, and on the next night Hellbender once again hosts a TCT fundraiser. If you've attended the TCT fundraisers in the past than you know how much fun they are, don't miss this one; the music is loud, the prizes are awesome, and Hellbender gets hot and the only way to maintain hydration is copious amount of grog.